The Shield: Dark blue and gold are the colors traditionally associated with the Navy and recall the sea and excellence. The gold cross suggests the Navy Cross, one of the many decorations awarded to Admiral Carney for operations against enemy Japanese during the Battle for Leyte Gulf, from October 23 to 26, 1944... "(He) rendered invaluable assistance in formulating the plans for a series of combat operations in which tack forces of the third fleet engaged capital ships of the Japanese fleet, waging devastating attacks on major Japanese combatant and carrier task forces in the vicinity of Mindora, the Sulu Sea, and areas northeast of Luzon and off the central Philippines..." The helmet is symbolic of ancestral Viking and Celtic ferocity in combat. The four stars stand for the four Distinguishing Service Medals received. CREST Issuing from a wreath Or and Azure, three demi-spears pilewise Proper superimposed by a stylized anchor Or. Symbolism: The two spears form a "V" alluding to Admiral Carney's Legion of Merit with a "V" (Combat Distinguishing Device) for exceptionally meritorious conduct...in action against enemy Japanese forces... March 5-6, 1943 and the Bronze Star Medal with combat "V" for operations in the Solomon's area on the night of July 29, 1943. The three spears represent submarine, surface and air warfare. 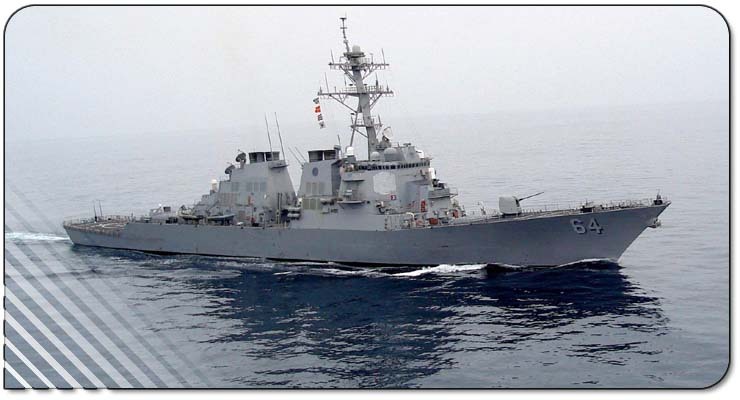 The anchor is reminiscent of Maritime tradition, United States naval strength, sea prowess and excellence of achievement. 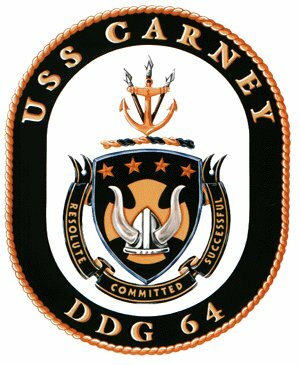 Motto: A tripartite scroll Azure doubled, garnished and inscribed "RESOLUTE COMMITTED SUCCESSFUL" in Gold The coat of arms in full color as in the blazon, all upon a white background enclosed within a dark blue oval border edged on the outside with a gold rope and bearing the inscription "USS CARNEY" at top and "DDG 64" in base all gold.